Sky Scrapers don’t get any bigger with the highest construction on the planet, than Burj Khalifa. Soaring 2,717 feet (828 yards) high with over 160 stories, the building has a stepped layout that narrows as it scales syringe-like to the skies. This Dubai attraction is delivering a new meaning to the word skyscraper, the iconic building is part of the enormous Down Town Dubai complex of offices, hotels, shopping malls, entertainment precincts and luxury apartments. You can experience breath-taking views of the impressive Dubai skyline from the top of this architecture wonder. The unique architecture of Burj Al Arab is more than just a luxury 7* hotel but is also a symbol of modern Dubai. Repeatedly voted the planet’s most luxurious resort, this glorious destination provides you with the finest luxury experience you can get in Dubai – right down to an elective chauffeur-driven Rolls Royce, helicopter trips via a renowned helipad, private beach access, high-end discretion on a breath taking terrace with pools and cabanas together with a few of the world’s best eating places, such as the highly-acclaimed Nathan Outlaw at Al Mahara. 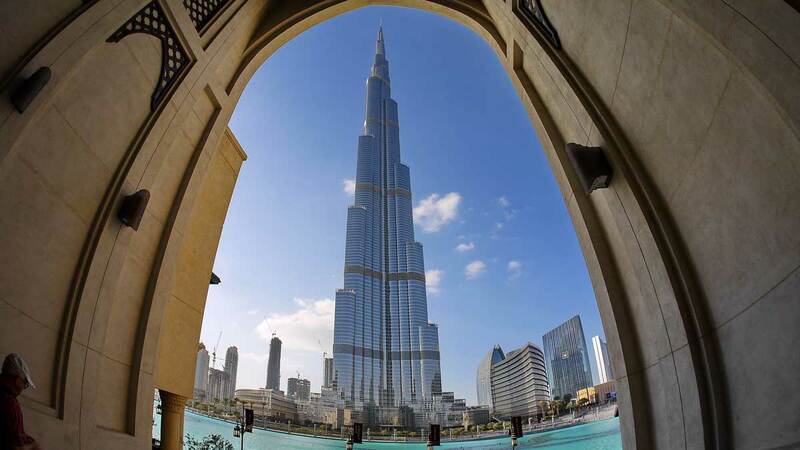 This sail shaped structure has quickly grown into the list of top Dubai tourist attractions. The resort has prevailed in 1999 since its launching, and its curved exterior was featured on the covers of numerous design magazines. It is advised to have a reservation or hotel booking to get an entry inside this luxury hotel. 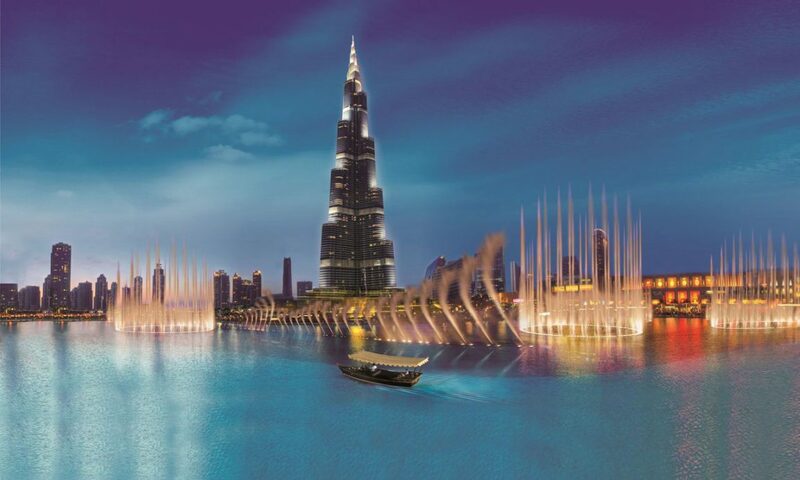 The Dubai Fountains are unquestionably worth seeing on your Dubai Holidays. The display is likely less than half an hour but do check for display timings on the web site as well as directions on how to get there so that you can ensure you get a nice place to stand and view. The fountains are synchronised to music playing. It is like light and water dancing to the music. It is truly amazing and an experience you cannot forget. The elevation that the water sprays reach is quite mind boggling – that being said, the engineering that went into the plan and working with this is quite impressive which makes it a one of the best places in Dubai . Fancy beating your fears with an adrenaline rush, look no further – Skydiving is precisely everything you will need. 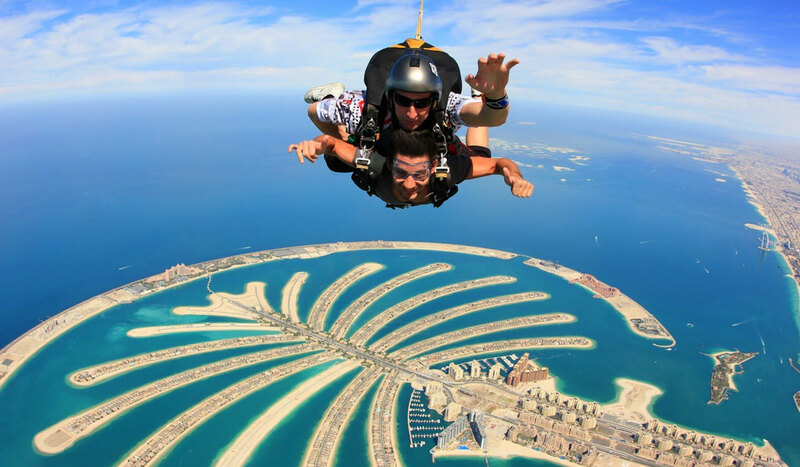 Skydive Dubai is among one of the main attractions for visitors in Dubai and it can be best experienced by with Sky-Dive Dubai, a top diving company in the Emirate. They provide sky diving over outstanding areas such as the Palm Jumeirah and another at the dunes situated about 35 kms outside of town. Your heartbeats steadies as your about to take the free fall and it’s all about the hurry in taking the jump – but once the parachute opens, you will have the time to gaze around you as well as begin to see the whole world in a new light. 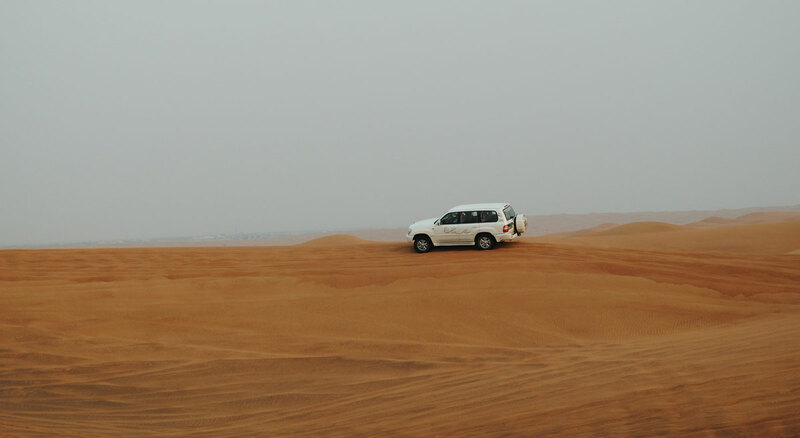 There is one experience which you should not miss out on during Dubai Holidays, the Desert Safari. It really is one of the original tourist attractions of Dubai and the exciting experience you cannot get somewhere else on earth. Depending on your own preference, you are able to pick morning, evening and overnight Desert Safari. Furthermore, you are able to personalize your trip with activities like Dune Bashing, Camel Riding, Sand Skiing, Belly-Dancing, Quad Biking Buffet Supper and BBQ. There is definitely something happening at the Kite Beach. 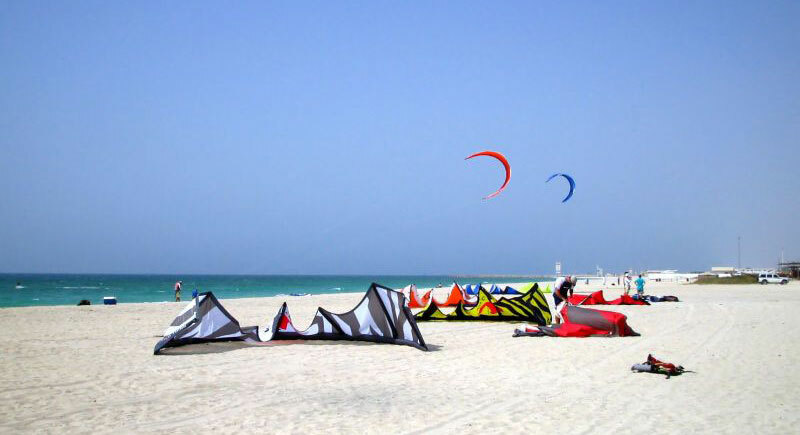 As the name implies, this shore is the complete hot-spot for Kite surfers, or for people who prefer to turn into one. On the other hand, the beach is very popular with singles and families due to the numerous activities available in the water along with on the shore. Additionally, you can go for banana boat rides, deep sea kayaking, fishing, etc. There is additionally a big selection of juice bars, food trucks and eateries using numerous international cuisines and refreshing beverages to round off the image of the beach that is well-known. If you do not want to pay much for a place to spend your day at, drive to the Kite Beach and have a great experience with the choice of amazing food, beverages and range of activities for everyone. The Museum is an excellent display for the brief history of Dubai. From a pearl diving township, the City has exploded in the last 30-40 years right into a transnational metropolis where imaginations run wild and goals are seen to reality. This memorial, full of life sized wax mannequins, allows visitors to virtually interact with culture and to wander by means of a day in the life span of several different individuals. This little museum will probably be an unexpected solution to walk through period, if you’re interested in just about any touch of history and tradition of Dubai. Mall of Emirates is highly known as it is the residence to Ski Dubai, a community theatre, an ultra-luxury 24 screen multiplex cinema and many global brands shop. 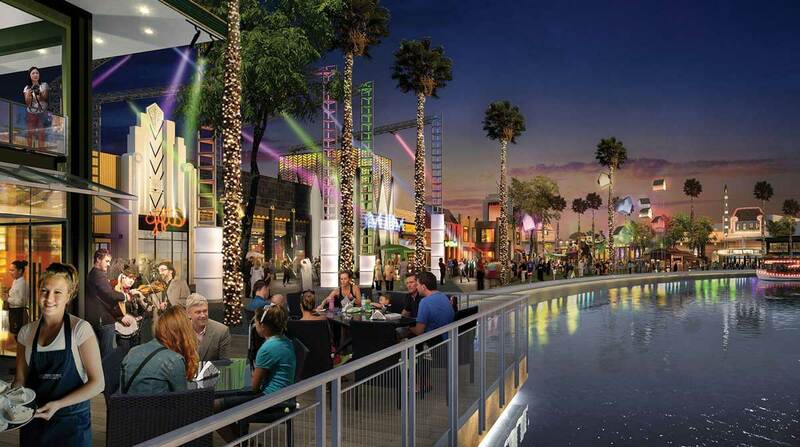 The multiple storey mall has shops for home furnishing, shoes, apparels, food-court and snowboarding Dubai. The best part is that you could ski all year round and neglect that you are in a desert location. The royal Jumeirah Mosque encourages cultural understanding and displays Islamic tradition. Unlike many others, the Jumeirah Mosque allows non-Muslims to enter within. Everyone maybe part of a cultural tour of the mosque, which is complemented by a light Arabic breakfast with tea and coffee. The tour approximately costs 20 AED along with tour-guides who will show and explain the aspects of the Islamic religion, beginning with all the ablution ritual which needs to be undertaken before prayers. 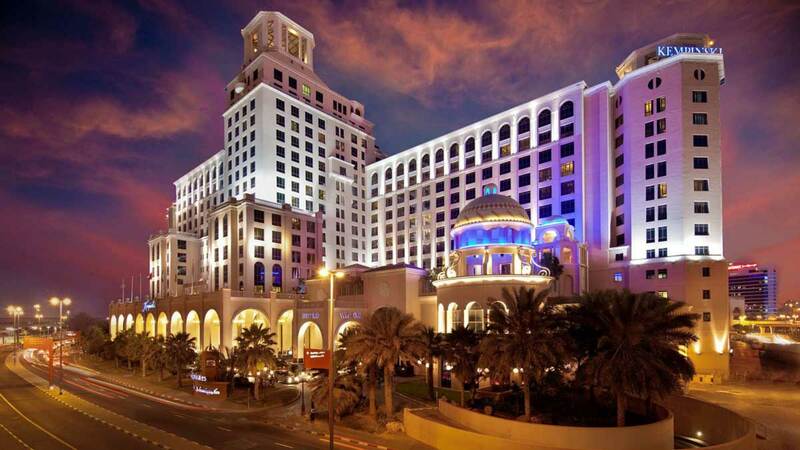 It is a spiritual and very peaceful area and also a must-visit Dubai attractions. Get an adrenaline-pumping with record-breaking rides and slides, right up close and personal with rays and sharks or kickback and unwind on 700 yards of pure private beach. Aquaventure Waterpark is the best waterpark in Dubai and also a part of Atlantis the Palm Dubai. If you plan to book your stay at this wonderful resort, there’s unlimited free access to Aquaventure Waterpark for resort guests, otherwise you have to buy tickets which cost approximately AED 205 – AED 250. Want to get a terrific Dolphin experience? Dolphin Bay is for you personally! It is one of the most sophisticated dolphin habitats in the world. 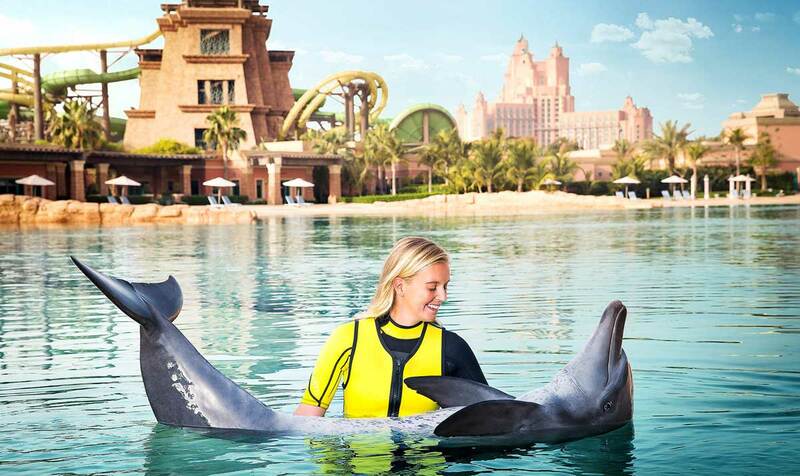 Find yourself up close with the dolphins, touch, swim and also get the opportunity to kiss and hug them in shallow water. The connection between their coach and the dolphin is very extraordinary. It really is an experience unlike any other and every one must have it on their bucket-list. There is also Dubai aquarium & underwater zoo which can go into your list of Dubai places to visit with family. Dubai Opera is the city purpose built multi-structure performing arts theatre as well as the authoritative location for shows and quality entertainment productions. 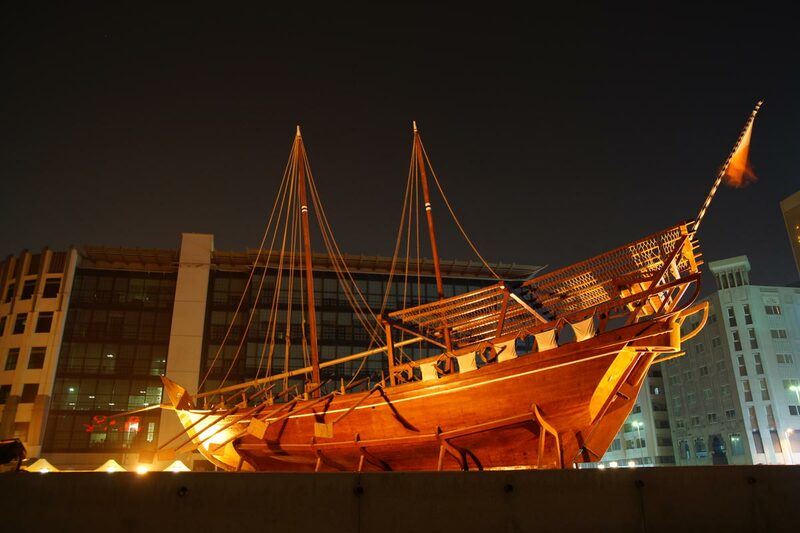 The opera is an architectural gem which got its design inspiration from tradition Dhow (old wooden boats). The Dubai Opera is sure to attract art lovers who will be delighted by the great acoustics and views with reasonable prices tickets for a fantastic experience. Dubai Park and Resorts is Dubai’s biggest incorporated theme-park resort consisting of three separate theme-parks named Bollywood Parks Dubai, Motiongate Dubai and Legoland Dubai, plus one waterpark; Legoland Waterpark. The entrance is featured by Riverland Dubai, gateway to Dubai Parks & Resorts and offers premium dining, retail and entertainment experience. It is the ideal destination for your Dubai holidays and don’t forget to view their promo video which will surely make you visit this resort on you trip to Dubai. 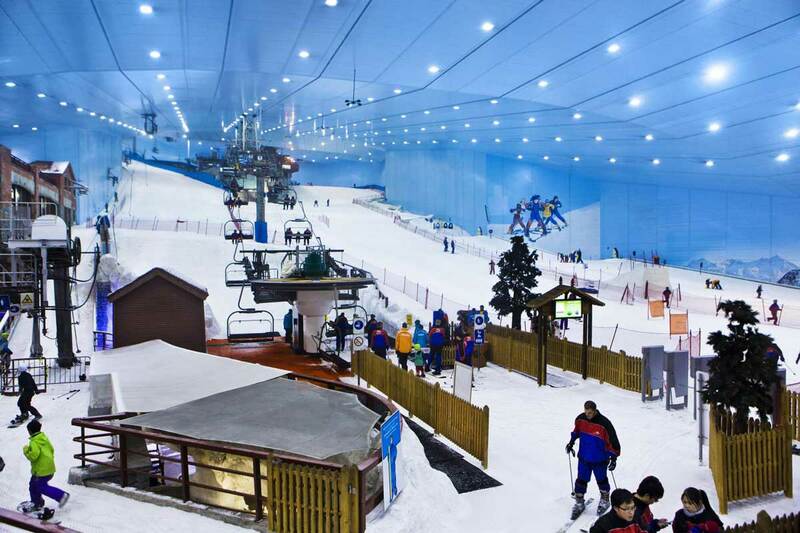 Ski Dubai is an in-door ski-resort, which is the first in the Middle-East, with 22500 square metres of interior skiing region. This is located as part of the Mall of the Emirates, among the biggest stores on the planet. Ski Dubai has 5 runs that vary in difficulty, elevation and slope where snowboarders and skiers of all ability levels will enjoy and snowboarders also can exercise their tricks in the Free-Style Area. Ski Dubai is one of the best tourist attractions in Dubai. 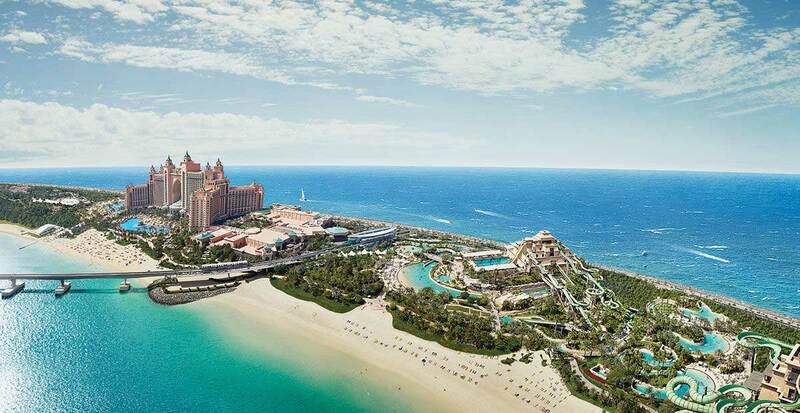 Check out more things to do in Dubai. Hope you are enjoying the list of top Dubai tourist attractions with us, it might have inspired you to plan your next holidays to Dubai. If so take a look at this travel advice. Our travel advice helps you to make informed decisions when you’re planning a trip overseas. 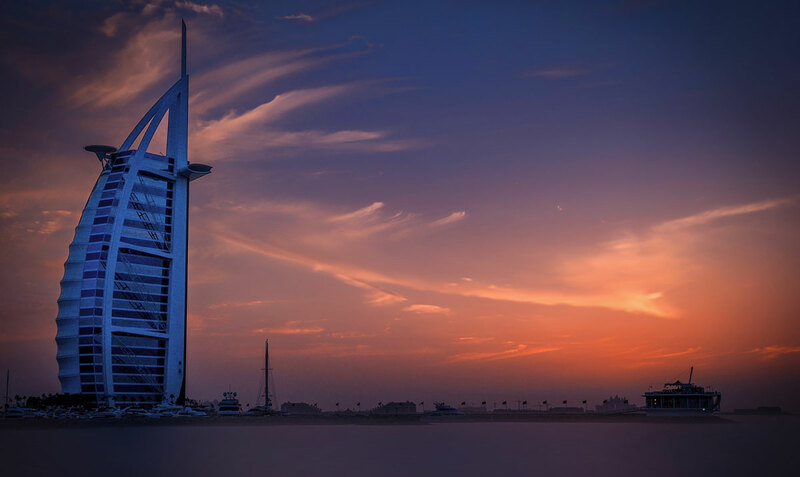 When to go, where to shop , Do’s and Don’ts, weather in Dubai, Dubai laws and regulations, top restaurants all the things you need to know about Dubai tourist attractions.